Realistic and lovingly designed simulation for M505, M503/DS100, M423, and M323 radios. Network support for simulation of radios in the network or on the Internet (data and voice). Record radio conversations that you have e.g. via the network and play them back at a later time. In about 60 lessons and tasks, you will gradually be introduced to the devices and radio traffic handling. Fictional radio to simulate a coast station. Simultaneous display of two radiosTry out all the functions in the "Free Simulation"
Radio call simulation: Start radio calls over a built-in transmitter for "eavesdropping". While the process is explained to you step by step for the first tasks, in the advanced tasks you take on the complete radio traffic management including radio operation and voice messages. You will receive feedback on any errors, sample solutions, and if necessary, instructions. 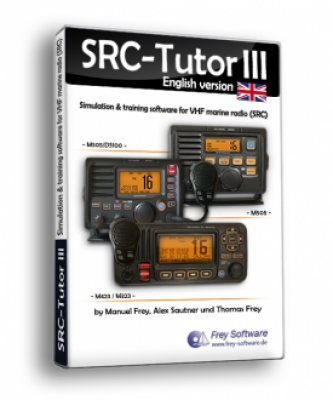 You can also practice completely freely on the device and thus simulate your own radio scenarios. In this case, a fictional radio simulates the coast station, another the voice radio. Let the radios receive the usual voice radio on the water. Take note of how the devices behave and what you will actually have to deal with in practice. SRC-Tutor III offers full network support through the network at home (LAN) or over the Internet. Send and receive DSC calls over the net and talk realistically via microphone and speaker on the radio with friends or colleagues. recommended: sound card, microphone, or headset. The SRC-Tutor III software and all other components contained on this CD-Rom are copyrighted. Any reproduction, distribution or rental is prohibited.